The Duke has to be on the led in the Cambridge Domain. And walking around the gardens there is no evidence of the rubbish and brambles that faced the newly formed Cambridge Domain Board in 1880. There is also no evidence of a pre European Maori pa where the playground and Art Society are now. Ko Arekahanara toku haona kaha Ko Kemureti toku oko horoi Ko Ngaruawhaia toku turangawaewae. Alexandra is my stronghold Cambridge is my wash basin Ngaruawahia is my footstool. 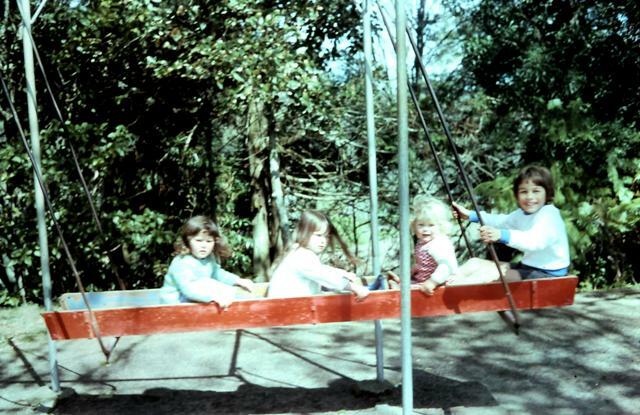 Jacque, Kelly, Clifton and David on the boat swing (now banned) 1975. The first reference to the lake being called Te Koutu, that I can find, is in 1875 when Rewi Maniapoto and party called at Cambridge and set up camp down on the flat near Lake Te Koutu. Charles W S Purdie (landscaper) lay down the structure to beautify the Domain and by 1885 he had laid paths and, with the Board’s help, planted out over 3000 trees. Thomas Brown looked after the gardening for the next twenty five years. New years day 1886 they had swimming races and played water polo on the lake and later boats were allowed until they were set adrift and upset the bird life. As children we were told the lake was bottomless, and it worked, we never went in the water. But The Duke – he loves it. He’s off his lead and checking out all the sights and sounds and smells. A lovely tranquil oasis. I was baby sitting The Duke recently so ‘walkies’ were part of the deal. We hit the dog park on the Green Belt early and the only other person was my neighbour – and dog Rusty. You wouldn’t read about it! We do a couple of laps around the park then (The Duke on his lead) we head through the Leamington Cemetery, (The Duke off his lead) down the steep steps to the stream. He loves the water, the smells, the trails, the freedom. We walked along the track in the farmer’s paddock and noticed to the right a steep hill. On top of this hill is the remains of a defensive ditch used by Maori in pre European times. The high triangle of land was possibly used as a lookout as (without trees) the line of sight would cover the Waikato River (east and west) and over to the Maungakawa and Maungatautari hills. 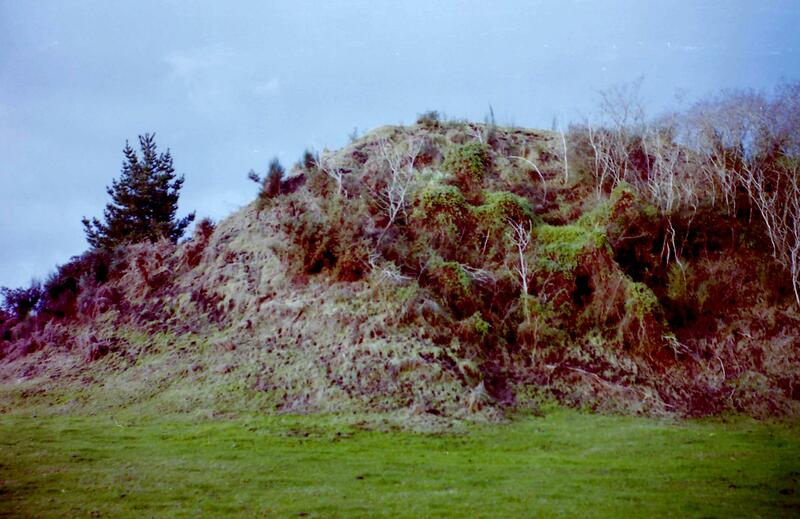 This site is listed with the New Zealand Archaeological Association. Then a splash and The Duke was down the bank, in the stream, having the time of his life racing against the flow.